Congratulations to Siva and The Biodiversity Crew @ NUS! The blog has been featured by the Pimm Group among the best biodiversity blogs, right next to legendary blogs such as Mongabay.com! This recognition is well deserved. The blog is led by the inexhaustible N. Sivasothi and gives me an excuse to share about him. 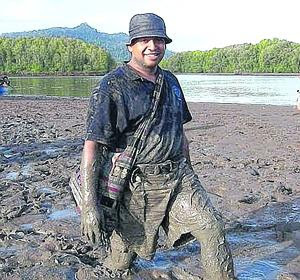 Although Siva is happiest knee deep in mud, he is also among the earliest adopters of social media, long before even blogs and facebook existed. His habitatnews blog is probably the oldest among biodiversity and nature blogs in Singapore. Siva is relentless about getting students and nature lovers to blog about our biodiversity. The latest being Ecological observations in Singapore (2010). This is part of the class assignment for the second year undergrads that Siva teaches. As usual, for this effort, Siva provides lots of background on why and how to blog about nature. Some of the more interesting blogs that are a direct result of Siva's prodding include the very amusing The Borg's Hideout. Their posts capture very well, the rather intimidating influence Siva can have on the rest of us (and why resistance to Siva is futile). As well as the meticulous and painstaking care Siva takes to train others in the proper way to blog. Many other existing blogs are a result of his prodding and pummeling, some of these are listed in the links below. My own effort at wildsingapore is very much a result of Siva's influence. It's not easy blogging, as Siva himself laments on his Otterman Speaks blog (which has lots of tips and inspirational thoughts about the more techie aspects of blogging and computing). What keeps us going is knowing that every blog post, every post on facebook increases the awareness about our biodiversity. We don't have to post a long masterpiece. A simple photo, some short thoughts will do. Something that will make people go "Wow, I didn't know we have such marvellous nature in Singapore!" So keep on blogging and sharing about our amazing biodiversity! More about Siva on wildsingapore. This post first appeared on the Celebrating Singapore's Biodiversity blog.